This week saw the planting of several more mandala "borders". This area is a two metre wide circle which encloses the six inner mandala circles. 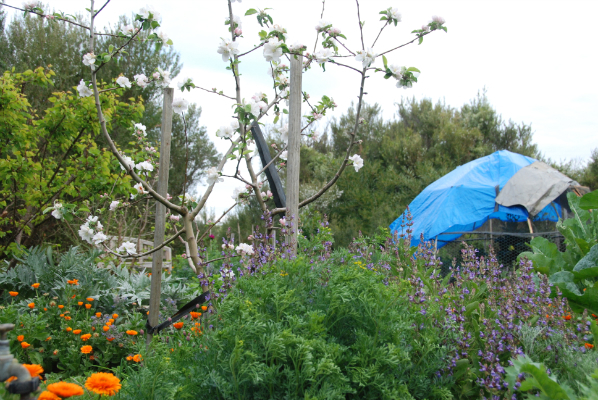 The border consists of fruit trees, perennial vegetables and flowers and a wide variety of herbs. The trick to doing less is doing more of what we humans do best: use our intelligence to see patterns, create designs, invent things - activities that come so naturally they feel like play. The other side of the coin is to do less of what we do worst. Humans make hard work of digging, but for worms it is fun. In planting out the herbs and perennials around the mandalas, I reflected on our house garden, which after three years is a great example of an established border. The perennial food plants planted in the border include artichokes, asparagus, fruit trees, strawberries and edible flowers. These are all producing in abundance now. In addition to autumn feeds of compost, their roots would be stretching out into the annual vegetable beds receiving the benefits of chickens and cover crops such as legumes which harness nitrogen. The herbs act as companion plants to the fruit trees and the vegetables. They attract and provide food for predatory insects and insect pollinators. They are a natural apothecary and a culinary pantry within a few steps of the kitchen. Their flowers are both edible and decorative. Many of the herbs are also micronutrient accumulators. These are elements that are essential for proper plant nutrition but that are only needed in minute amounts. Some herbs accumulate very large amounts of micronutrients, even in soil that is deficient. Using these herbs in mulch and compost spreads the micronutrients around the garden, making them available to vegetables that may not be quite so proficient at mining them for themselves. The herbs and perennials have matured since their original planting. In many areas they completely cover the earth. This is beneficial as it does not offer weed seeds the opportunity to sprout or creep in and it provides a living mulch in summer keeping the roots of the fruit trees cool. Herbs can be trimmed and given to the chickens who can self medicate themselves if they are deficient in a nutrient (much like humans use vitamins and supplements) or just scratch them back into the earth adding trace minerals to the soil. Several of the herbs are compost activators. Alternatively, the herbs can be added to a seaweed brew, making a nutrient rich tea that can be used a s a plant tonic or for wetting down the compost. The mandala border acts as a protective barrier for the inner circles. It prevents weed, grass and pest invasions from the edges. Again, with the house mandala which began in Feb 2008, one would not know that there are vegetables growing unless they stood on the roof or walked through the pathway entrance to the garden. The herbs and natives have formed a natural "wall", offering wind protection to the tender vegetables as they are growing. They also provide predatory birds a vantage point and predatory lizards and frogs habitat. The circle design of a garden was not new to me as a gardener, nor was planting herbs, flowers and vegetables together. What I have found brilliant about the mandala design though is heavy feeding vegetable beds are kept in rotation without ever interfering with the perennial border. The perennial border is being fed by the vegetable beds while providing all of the other benefits indicated above. The two independent systems work cohesively together creating a very healthy garden ecosystem. In its first two years, the border did require energy. We seeded most of the herbs and helped the little plants to get established. There were more weeds the first two years as there was still bare earth. I am continually amazed at the quiet job the herbs are doing at improving our soil. Our chickens are incredibly healthy. Our time spent combating difficult fungus and pest problems on both the vegetables and the fruit trees has also reduced. Once established, the human effort in maintaining this system is surprisingly minimal. This week, our friend Baxter of Palate Earth joined in to help plant three more mandala borders. It was great to have the help and also nice to share the beneficial aspects that the herbs are providing to the mandala. Thank you Baxter. Link here for more photos of establishing the mandalas.